You Could Use The Wii U To Play Games. Or, You Could Use It To Find Love. The Wii U sure has seen some creative usage. First there's the Miiverse, which some people have experimented with to make awesome communities and artwork showcases. Others have found a way to use the Wii U to make movies. Nintendo&apos;s Miiverse Isn&apos;t Xbox Live. It Might Be Something Better. Let's add a new one to the list: using the Wii U for love. Here's a gamer that hopped onto the Miiverse and decided to use the Wii U's social-network as a place for a personal ad. Kotaku's Stephen Totilo reckons that the post might be on the YouTube channel because of the live video chat app, which could be useful if anyone takes Adam up on his offer. Cynical? 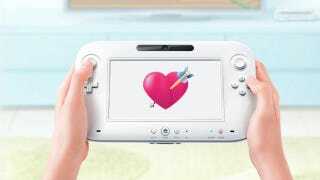 Hey, the Wii U has already proven to be a facilitator when it comes to love-related things. Here's another gamer talking about how the Wii U has been great for his marriage, in that it allowed him to share his passion with his wife. But anyway, yo, ladies? Don't keep your hero of time waiting.